Product Group: Car Stereo Bookmark To MyTotalUSA! 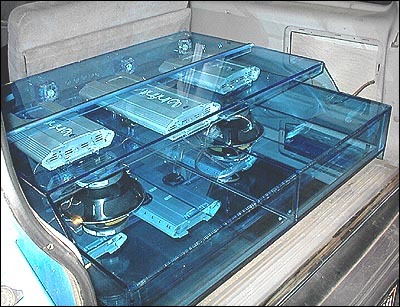 Custom designed and built acrylic speaker boxes, for custom car stereo installations. We can build your custom dreams come true! Pictured is a custom transparent blue acrylic speaker and woofer box. Also included in the box in clear mounting brackets for cooling fans, capicators and all the wiring. The top has a clear hinge, allowing easy access to amps and components. Prices for customized speaker boxes starts at $700. The custom tinted blue box pictured here was made for a the back Ford Explorer. It holds two 15 inch subwoofers, three amplifiers, a capacitor features a mirrored bottom. The back of the amp section has a seamless clear hinge, allowing easy access to adjust amp settings. This custom box was priced around $3,000.